François le facteur: It's not my fault if your goat gobbles up telegrams. When I first saw this film I couldn't get it out of my head, and put it in my all time top ten. 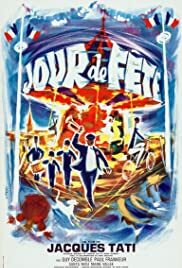 The magic has faded a little, but this remains a classic for its strange mixture of gentle slapstick, sight gags and verbal jokes, and its beautifully atmospheric portrait of French rural life.